Looking forward to Celebrating Women's Histories 2015. As you will notice this years theme is weaving the stories of Women's lives which is right up my street. The exhibition opens on March 3rd, private view 5th of March. Please let me know if you're coming and I will be sure to be there to meet you. I have added an image of my work in progress, it gives you a taste of what to expect.Hopefully something there to interest you! A glimpse of my piece as I worked on it! Well January 2015 has been hectic and I can't believe we are already half way through February! Just as a quick update I wanted to say that I loved taking part in the Anti Gallery Gallery show organised by Degrees of Freedom. The publicity we received for the show was brilliant, including an interview with Ahmed (curator, and member of Degrees of Freedom Collective) on the Robert Elms Saturday show on Radio 6 and a mention in the RA Magazine Twitter feed.We were also number 3 in Time Outs ten exhibitions to see in London this January. We had a huge amount of visitors and some interesting reactions to the exhibition. 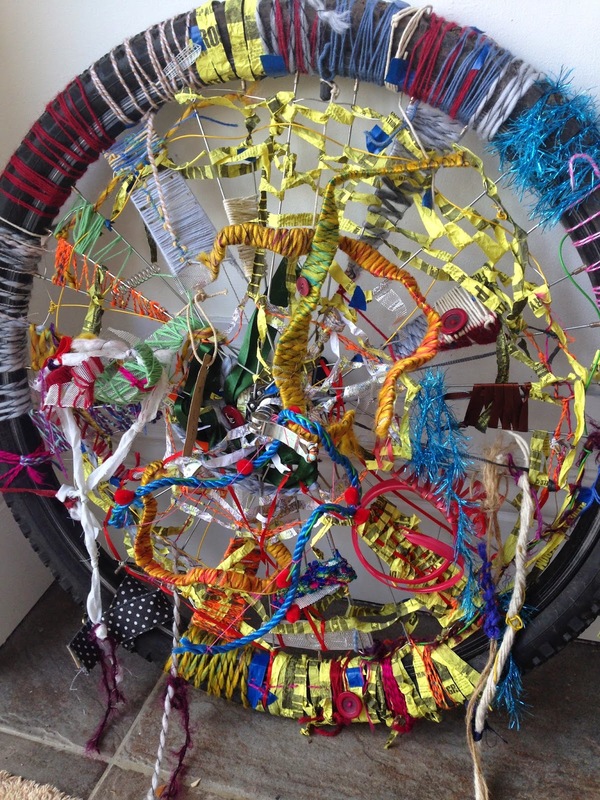 I was delighted with the participatory nature of the exhibition .We managed to weave this bicycle wheel and also made some interesting work thinking about journeys. Thank you to Degrees of Freedom collective for organising. 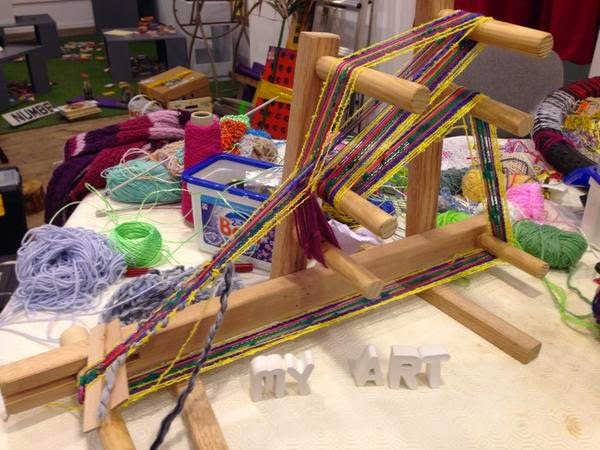 On the final session I decided to start to make Knots on Twine , representing our recollections of journeys I had made. The idea came from my reading of Tim Ingold's "Lines", where he describes how tribespeople from Papua New Guinea recorded their journeys using knots on chords. Thank you to those of you who contributed, it has inspired me to continue with this work, I have attached your memories on chords to the bicycle wheel! I was also delighted to have a piece of work selected for the "Soil" exhibition organised by East Kent Creative at the Horsebridge Centre. It was a beautifully curated exhibition and I enjoyed the feedback I received from visitors about my piece, "Provenance". 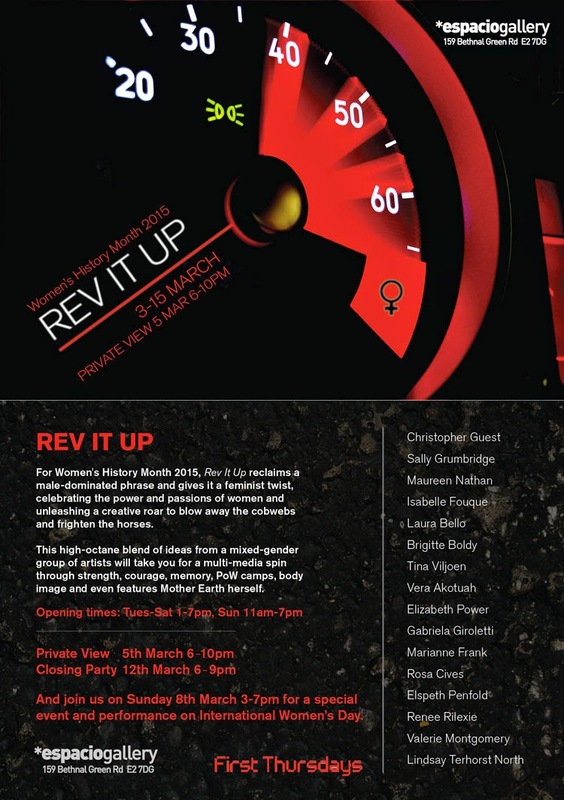 I am now preparing for Rev It Up an exhibition at Espacio Gallery, as a part of Women's History Month 2015 . I am attaching our promotional video which I hope has the desired effect and awakens your curiosity to pay us a visit!